SapuraKencana Petroleum Bhd (SKPB) said it has entered into three conditional sale and purchase agreements (SPA) to acquire interests in several assets in Vietnam, for US$400 million (RM1.35 billion) cash. According to its announcement, the agreements were entered via its wholly-owned subsidiaries SapuraKencana Energy Vietnam (Cuu Long) Inc, SapuraKencana Energy Vietnam (Nam Con Son) Inc and SapuraKencana Energy Vietnam (Cai Nuoc) Inc, with Petronas Carigali Vietnam Ltd and Petronas Carigali Overseas Sdn Bhd. Through the three SPAs, SKPB shall acquire 50% interest in the petroleum contract for blocks 01/97 and 02/97 Cuu Long Basin, 40% interest in the production sharing contract for blocks 10 and 11.1, Nam Con Son Basin, and 36.845966% in the product sharing contract for block 46-Cai Nuoc, Malay-Tho Chu Basin. “The proposed transaction will enable SKPB to execute its strategy to build a portfolio of assets that will give sustainable growth and visibility on its longer-term income stream,” said the group. The counter rose two sen to RM3.10, giving it a market capitalisation of RM18.46 billion. Genting Plantations Bhd’s (GenP) net profit soared 91% to RM69.3 million in its third quarter ended Sept 30, 2014, from RM36.3 million in the previous corresponding quarter. The sharp jump on earnings was mainly due to higher contribution from its plantations in Indonesia and higher recognition of property sales, coupled with the progressive completion of development projects during the quarter. Also, there was pre-tax loss of RM38 million, categorised under “others”, in the previous corresponding quarter that had weighed on the earnings then. GenP’s revenue however, grew barely 8% to to RM370.5 million, from RM342.5 million, according to the announcement to Bursa Malaysia. The group’s earnings per share (EPS) stood at 9.1 sen per share for the quarter, compared to its previous EPS of 4.79 sen.
For the nine months ended Sept 30, GenP recorded net profit of RM239.6 million, nearly double of RM122.7 million achieved in the previous corresponding period. The group’s accumulative revenue for the period climbed 9% to RM1.06 billion, from RM976.2 million a year earlier. EPS for the cumulative period rose to 31.4 sen, from 16.18 sen. Going forward, GenP said its performance for the rest of its financial year will largely depend on CPO prices, weather conditions in the major oil palm growing regions, crop production, changes in the cost of inputs, currency exchange rates and property market conditions. GenP share price was unchanged at RM10.46 today, with a market capitalisation of RM8.05 billion. In contrast, Rimbunan Sawit Bhd's net profit for the third quarter ended Sept 30, 2014 (3QFY14) plunged 93.2% to RM746,000 from RM11.1 million in the same quarter a year ago on lower sales volumes for crude palm oil (CPO), palm kernel (PK) and fresh fruit bunches (FFB). In a filing with Bursa Malaysia today, the oil palm plantation company said its revenue fell 24.5% to RM61.98 million in the 3QFY14 compared with RM82.05 million a year earlier. EPS for 3QFY14 was lower at 0.04 sen compared to 0.54 sen in 3QFY13. For the nine months ended Sept 30, 2014 (9MFY14), Rimbunan Sawit recorded a net profit of RM7.7 million, reversing its net loss of RM13.38 million a year earlier. Revenue for 9MFY14 fell 8.8% to RM185.79 million from RM203.71 million in 9MFY13 on lower sales volume for CPO and PK. EPS for 9MFY14 was 0.38 sen from a loss of 0.66 sen previously. Rimbunan share price closed 1.5 sen or 2.27% lower to 64.5 sen today, for a market capitalisation of RM857.07 million. Mah Sing Group Bhd’s net profit jumped 21.7% to RM85.9 million in the third quarter ended Sept 30, 2014, from RM70.6 million in the previous corresponding quarter. In a filing with Bursa Malaysia, the property developer said its third quarter revenue leapt 33% to RM713.6 million from RM536.5 million a year earlier. For the nine-month period, net profit grew 21.3% to RM254.7 million from RM209.9 million in the same period last year, while revenue surged 43.6% to RM2.06 billion from RM1.44 billion previously. On higher revenue, the group attributed to the higher work progress from its ongoing development projects. Mah Sing achieved property sales of about RM2.45 billion for the nine-month period, as it focused on the mass market properties at the right locations, in line with market demand. On prospects for the current financial year, Mah Sing said the Greater Kuala Lumpur market is expected to be sustainable. This is especially in the new growth corridors benefiting from ongoing and proposed transportation infrastructure projects, such as the MRT, LRT and the Kuala Lumpur-Singapore high speed rail projects. Meanwhile, the group has proposed a warrant-sweetened rights issue to raise RM630 million and a one-for-four bonus issue, for land acquisition and property development activities. From the RM630 million, RM370 million has been ear-marked as part-payment for land in Negeri Sembilan and Puchong, said Mah Sing in a separate filing with the stock exchange. Mah Sing said the RM370 million will be used to replenish a previous payment made for the Seremban and Puchong land, as well as to fund payments over the next 12 months. The proposed rights issue and bonus issue are expected to complete by the first quarter and third quarter next year respectively, following approvals and barring any unforeseen circumstances. Mah Sing ended flat at RM2.31, with a market capitalisation of RM3.41 billion. Petron Malaysia Refining and Marketing Bhd saw its net loss widened to RM8.66 million or 3.2 sen per share in the third quarter ended Sept 30, 2014 (3QFY14) from RM4.89 million or 1.8 sen per share previously. Revenue in 3QFY14 slipped 7% to RM2.62 billion from RM2.81 billion previously. For the cumulative nine months ended Sept 30, 2014 (9MFY14), Petron saw its net loss trimmed to RM16.89 million or 6.3 sen per share from RM17.82 million or 6.6 sen per share a year ago on a 9% increase in domestic sales volume to 14.6 million barrels from 13.4 million barrels. Revenue in 9MFY14 grew 3.5% to RM8.61 billion from RM8.32 billion previously. Petron’s shares fell 10.82% from RM3.04 on Apr 25 to close at RM2.71 this evening, giving it a market capitalisation of RM731.7 million. Petron did not declare any dividend in 3QFY14. IJM Corp Bhd has secured a contract worth RM355.68 million from Utama Lodge Sdn Bhd, in relation to a proposed commercial development in Ara Damansara. In a filing with Bursa Malaysia today, IJM said its wholly-owned subsidiary, IJM Construction Sdn Bhd, has accepted the Letter of Acceptance from Utama Lodge. It said the contract is for the main building works for the proposed commercial development dubbed "The Potpourri" in Ara Damansara. According to IJM Corp, it will be tasked to build eight blocks of 11 to 13-storey serviced apartments (712 units) on top of a 3-storey podium comprising of retail outlets, elevated and basement car parks, multi-level club house and rooftop recreational. The construction period of the project is 28 months. IJM Corp share price was down 9 sen or 1.32%, closing at RM6.72 today, with 2.66 million shares having changed hands. With the closing price, IJM has a market capitalisation of RM10.02 billion. ACE-market listed Systech Bhd ( Financial Dashboard), which has drawn strong trading interest of late, posted a 118% jump in net profit for the second quarter ended Sept 30, 2014 (2Q15) to RM1.04 million from RM477,000 in the previous corresponding quarter. Earnings per share in the quarter doubled to 0.33 sen from 0.15 sen.
Quarterly revenue swelled 59.5% to RM2.61 million compared with RM1.64 million a year ago, “mainly due to higher contribution from Mobysys’ [Sdn Bhd] customers”, said Systech in a filing to Bursa Malaysia. For the six months ended Sept 30, 2014 (6MFY15), Systech’s net profit more than doubled to RM1.84 million from RM667,000 in the previous corresponding period. Revenue came in 66.3% higher at RM4.78 million from RM2.88 million a year ago. 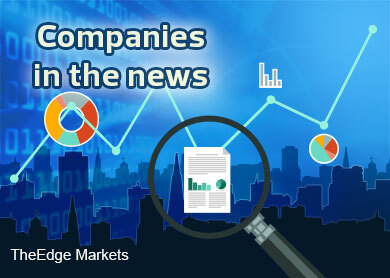 In an interview with The Edge Financial Daily three weeks ago, CEO Raymond Tan said the group was looking at a double digit growth in revenue and profit for current financial year ending March 31 and FY16. Systech is the second most actively traded stock on Bursa Malaysia today. Its share price rose 4.5 sen or 18% to all-time high of 29.5 sen since it was listed in 2011 through a reverse take-over. At the one-year mark, the stock has almost tripled in share price from trading at just levels of 10 sen a year ago. Its market capitalisation today stood at RM79.33 million.